Project Start Date: The project started in 09/01/13 and went through the regular Permitting & Inspection (P&I) process. It was taken over by the Hybrid Collaborative Delivery Team (HCDT), which utilizes BIM-IPD, in March 2014 and the umbrella permit was granted on 09/01/14. Project Status: Currently, construction is 85% complete and the estimated date of completion is 01/14/16. 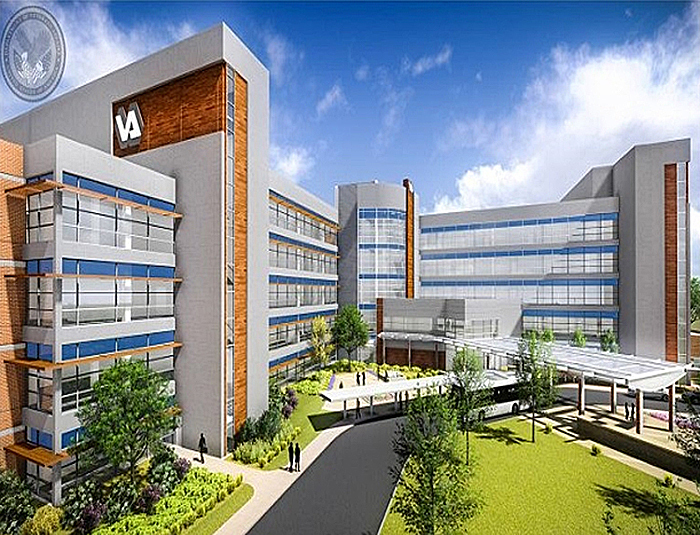 The VA Health Care Clinic located in Charlotte, North Carolina, is a 20 year lease back, designed by RPA Design, P.C., built by JE Dunn, and owned by Childress Klein Cambridge. The building was fully modeled and documented within different BIM environments, including a total of 12 Revit models and over 29,000 pieces of equipment. The equipment was fully modeled and tracked through the design and implementation processes. The IPD process using the Hybrid Collaborative Delivery Team was well suited for this project as it was modeled using BIM software. It was also a fast track project with several unresolved design elements at the start of construction. The design team refined their model by incorporating the client driven change requests and changes driven by field conditions while the construction was in progress. Due to the cyclical nature of permitting and inspection when using this process, the design team had the flexibility of releasing small portions for construction as their model evolved. An umbrella permit was issued at the very beginning of the process; it was the only permit issued for the project (Ref: NC Admin code section 106.2.3.1). The design team and the construction team continuously worked on the model and it was reviewed by the code officials as it evolved. The project team established milestones for submitting a snapshot of their model for review, approval and construction. Each review cycle is called an iteration and the submitted model was reviewed for code compliance by all county trades and city agencies (AHJ). Upon approval, that portion of approved work was executed and inspected in the field. At times when there were inconsistencies in the field, it was brought to the attention of the design and construction team and asked to be incorporated into the next model update. The work progressed unhindered, even at times when it would have been typically stopped had they used the conventional P&I process thereby rendering the customer significant savings in time, money, and resources. See complete view of the process flow chart . The VA project received the umbrella permit on Sept 01, 2014. They have been through eight iterations so far, which include owner-driven changes, field changes, and coordination updates. The project is estimated to be completed on January 14, 2016. The City of Charlotte and other external agencies such as zoning, backflow prevention, and public health are involved with this project. They reviewed all their documents at the beginning of the project, and the issuance of the umbrella permit was contingent upon approval of certain specific agency documents. The Integrated Project Delivery (IPD) process enabled all the stakeholders to work on the model at the same time. The architect used Autodesk Revit to build and document the model. The BIM model was then shared on a cloud server to collaborate with client, consultants, and contractors. All the project stakeholders were able to monitor the changes made to the model simultaneously and they could make necessary adjustments to design and cost at their end. The BIM-IPD process also offered greater collaboration among construction trades as they were all able to work harmoniously in the field without interfering with each other's system layouts as most of the clashes were detected in the model prior to construction. Code officials were able to avert costly redo expenses related to concrete work at the stairs by alerting the construction crew of a reversed stair direction that was getting ready to be poured. They accessed the BIM model in the cloud and helped them rectify the problem in the field. Code officials alerted the design team on several code items such as occupancy count, details of shaft walls, parapet wall heights, etc. very early in the project which helped the design team model their project very efficiently. Through various uses of technology, the VA HCC Charlotte was designed and documented very efficiently. The use of Autodesk Revit to build and document the full BIM model for coordination allowed for a very smooth design and coordination process. The permitting and inspection was done by the Hybrid Collaborative Delivery Team with the same team of code enforcement officials handling the project from start (plan review) to finish (inspections) and CO. The plan review was conducted in the 3D BIM model. The applications were submitted through Electronic Plan Management system used by Mecklenburg County for all commercial projects. Review files were uploaded directly to the County Dropbox website (cloud server). 2D files were reviewed using Autodesk Design review and 3D files were reviewed using Navisworks platform. Review comments were shared as redlines in *.DWFx files and as Viewpoints in the Navis model. The code officials used Windows Surface Pro to store and access the approved model in the field. Virtual Inspection mark-ups were created and shared using Bluebeam Studio on Surface Pro. The NC Building Code Council defined an alternate way to review and permit BIM-IPD projects. See code section . The NC Board of Architecture and NC Board of Engineers provided alternate professional seal use criteria for BIM-IPD. See the NC Architecture board position statement . See the NC PE board projects guidelines . RPA Design was well prepared to adopt the HCDT/IPD process. After a few initial roadblocks, the County was able to get timely submissions that were well formatted with a detailed scope during each model update, which tremendously helped the review process. Since the County has no control on scheduling the reviews for the city agencies, some review cycles took longer than expected to close out. The County IT infrastructure cannot accept all file formats, so they currently have multiple points for data storage. Since this was the first time a complete review was conducted on the 3D model, the HCD team discovered that adding relevant data to the model can significantly expedite the review process. The plan reviewers had to go through a learning curve to train themselves on the new software to review the 3D model. Further, a decision had to be made on how much information they could expect to see in the model which depended on how much data was loaded into the model and how well the details were developed. Since this process is most suited for fast-track projects, there were a lot of unknowns at the beginning. Through the process the importance of getting some critical information in advance was realized although that portion of work might not be executed until the very end; ex. Loads on the electrical generator. Better synchronization is required between the design and construction team when updating the model. Situations occurred where construction overtook documentation and created confusing situations for the building inspectors who were also the plan reviewers on the project. The inspection team has adopted a unique process which helps them mark up and monitor the inspected items electronically thereby making the inspection process more efficient and less erroneous. Introducing BIM/IPD based plan review and inspection in a regulatory environment worked favorably for the design and construction team who were already using this platform for documenting and managing their most complex projects. The ability to have an open dialogue with the HCDT code officials gave the project design and construction team a great advantage. Engineers, architects, and contractors were able to talk about regulatory issues with code officials well ahead of time in a virtual environment, which facilitated the project team in making early decisions on conflicting items. Using the BIM model during construction helped reduce cost as it eliminated rework in the field in most cases as the problems were detected very early. The construction team used the BIM model to run clash detection on the building systems and this enabled quick and coordinated installation of the systems by the construction crew. They were able to execute their portion of work without depending on the schedule for other trades. For example, the electrical conduits and plumbing pipes were placed at a predetermined elevation and location based on the BIM model, and were independent of when the HVAC ducts went in at the same location. This helped reduce the labor costs due to ease of installation. They also used the BIM model to generate files that were detailed enough for fabrication. Pre-fabrication of building elements greatly reduced the construction costs. BIM modeling allowed systems to be modeled in sections that were easily built in a controlled environment off site (higher productivity and better quality) and then pieced into place on site. The project team used electronic positioning products like Trimble which utilized data from the BIM model. This greatly improved accuracy and reduced the manpower required to perform this task manually in the conventional way. Data from Cambridge Healthcare Solutions, LLC (Owner/ Developer): See original letter . BIM-IPD process reduced overall time for permitting and inspections including processing of model updates by 90–120 days. Based on the ROI for this development, the costs saved due to early completion of the project plus the cost saved in permitting and Inspection fees using BIM-IPD, when compared to the conventional process, are estimated to exceed $3 million on their $150 million investment. View of the entrance to the VA Clinic. Fireproofing of the main structural members near the stairs (virtual and actual inspection). HVAC duct layout above the ceiling (virtual and actual inspection).